Hearthstone, then: what do you make of it? The 1,600 of you fortunate enough to win a Hearthstone beta key in the giveaway that almost killed our poor site will have spent at least a night with Blizzard’s TCG by now. That’s long enough to take in its scent, or get sick of its snoring. So: what do you think? 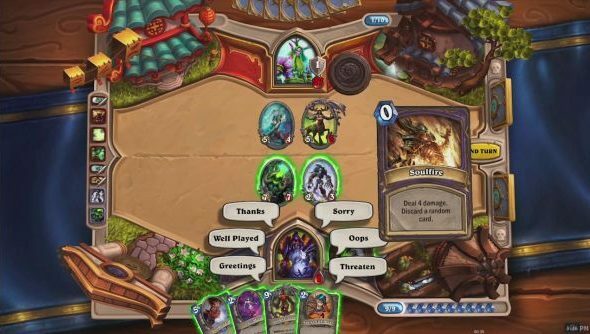 Our own thoughts are still much the same as those we recording in our Hearthstone first impressions piece: it’s a marvellous and typically Blizzard blend of polish and potted compulsion. And best of all, you never have to hear the horrible things your opponents are undoubtedly saying about you. The game has changed ever so slightly since then: gold rewards have gone right up, for starters, making the Arena a marginally more viable prospect for those without the RL cash to pay for entry. Do you like it? And have you unlocked the Arena yet? Nick’s been playing a lot of that on our Twitch stream, to varying degrees of success.